Studio series center channel. This 3-way 5-1/4" center channel loudspeaker with high-impact molded enclosure reproduces sound with unmatched clarity and power. I rescued this treasure from my local recycling dump about a year ago and used it in a zone 2 in the dinning room. It sounded great due to 3 way design and high power. It was obviously neglected for some time and I cleaned out the dead spiders and dust! I finally decided to swap it into my main HT since my current center only hit 90 Hz when calibrated with my onkyo tx-nr818 with audessey multi eqt32. The audessey calibration and separate mic measured it good down to 60 Hz! Thus I set it to 80hz and it has been a great addition to my 9.1 HT. Just goes to show that quality stands the test of time and in my case the trash. Compactor!!!! paid $20. replaced an older Boston 2 way center. The Tonal quality is flawless. Can't go wrong for $20! I just purchased this for 45 bucks on Craigslist and it far surpasses all the other speakers Ive had. I am using it with a Pioneer VSX1019 and the sound is unbelievable. When I heard that the center was the most important part of the home theater I was pretty skeptical. But in practice they're spot on. It totally brings out the fullest sounds from all your speakers. The rest of my system has some solid budget speakers that received great reviews. I was getting good sound before but this last piece probably added hundreds of dollars in value to my system as a whole. Before I had a smaller tin sounding center with one tiny speaker. I had no idea the difference this would make! I have to say this was the MOST informed purchase I made. And at 45 dollars I am still in astonishment. I see more modern center channels that are tiny and have the worst sound. These probably havent been made in years which is a sad shame. This is why most people's systems that spent many hundreds or thousands more than me sound weaker than mine. It doesnt matter if you mix and match speakers with a modern AVR--you can dial individual speakers down. I got much better value mixing and matching parts depending on the need i had (ie more sound out of the front--choose floorstanding or more bass a better sub). I have 1200 worth of speakers i paid less than 400 dollars for. What a pity they don't make these anymore! Bought this to upgrade an older JBL home theater system. Used with a pair of S38's in the back and an old but still excellent pair of L96's in the front all with 100 watts/channel with a 15" 400 watt subwoofer that can kill small animals. Clarity... this center is crystal clear for all uses - high - mid - bass whatever. You can set your receiver to "center-large" and not be disappointed with the response. While it's no subwoofer, it can handle down to a hundred Hz or so without issues but it really excels in the highs. Seamless fills. Excellent value, excellent sound. Only negative is the molded plastic case, seems cheap for the old-timers.. but what the heck, it works really well and what would you make something like this out of if not plastic? Besides, it looks great and has obvious quality manufacture. This center speaker just sounds so damn good. I see its been a while since anyone has reviewed this center channel speaker. Not surprising since its been out of production for so long. Speaker manufacturers are going to 3/4" and even smaller tweeters to make more money, trouble is the smaller tweets have less tonal range. JBL is no different. If you get a chance to buy one of these on ebay or elsewhere at less than $100, do so. You won't be sorry. I've had more than a few friends and family that swore they'd steal mine given the chance. Not much comes close to this speaker at twice the price. And most of those are 2 way, these are 3 way. 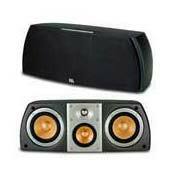 I use these with 4 JBL E50 northridge 3 way speakers at the corners and a JBL E150P sub, all driven by a very good sounding Harman Kardon AVR520. I have a superb sounding home theater sound for ~$1500. I am shopping for a larger sub but may add another E150P to the mix, not sure yet. Conversations during movies are clear and concise, no muffled verbage unless thats what the director wanted. Everything is heard where its supposed to be heard. I had an audiophile friend that installed two of these in his motorhome, along with a small sub, for stereo, radio and tv sound. It sounded better than most peoples home theater in a box system. While this speaker doesn't have the bass you'd expect from two 'bass' speakers, they are supposed to be good down to 75hz, but I don't hear that much come through them in the lower freqs. Kenwood HT in a box. A joke. I purchased this s center along with 4 s36 speakers and a PB10 several years ago for my home theater system. These are all great souding speakers and I would recommend them to anyone who wants a solid system. In fact, I am so into JBL quality and sound that I have the HTI6C Ceiling speakers throughout my home and the N26 and N24's outside for my porch and deck. All powered by Harman Kardon which his a sister company of JBL. Sounds incredible! Makes the whole system sound better and more open. Truly the best Home Theater purchase I've ever made. I was using the Cambridge Soundworks Center Channel Plus, and the sound never really pleased me(sometimes it sounded so nasal and boxy that I just shut it off and used the Phantom Center). I have a set of JBL LX's for both the front and surround speakers, so I decided to get a JBL to match as a center. The difference is astounding. The tonal character and timbre of the speaker matches my mains and surrounds, so there is a smooth and cohesive soundfield now. And I'm hearing details I've never heard before. The whole soundstage has been opened up by this extraordinary speaker. Even my subwoofer sounds tighter and crisper now. I can't recommend this speaker-and JBL speakers in general-enough. I bought this speaker back in the spring and I thought I would give it some time to really get to know it before I review it. My S/center II has provided me with great sound and clarity. The highs are crisp and the voice tones are seamless with the pair of S310II's that act as my mains. I have 2 rear and a rear center, all are JBL S38II's. And my Infinity Entra 2 adds the low end. They are powered by an Onkyo TX-SR600. I had some mixed matched JBL LX500's with JBL cheapie center and JBL L40's (Very old)for the rears. I cannot stress the fact enough that matched speakers are neccessary for the sound to engulf you into the movie you may be watching. That is true surround sound, not just sound comming from all directions. This center speaker produces great detail and realism. The plastic case is odd, but the sound qualith makes up for it. How many times do you handle your center channel anyway. I think it will be hard to beat it for the price!